General Plastics offers four different rigid high-density polyurethane foam series that satisfy a wide range of tooling applications – each with distinct characteristics and advantages. Our product development specialist, Alan Pagni, offers this overview of General Plastics’ tooling foam options and insights on how their properties align with specific tooling needs. The LAST-A-FOAM® FR-4500 Tooling Board is designed for tooling, modeling and signage. These boards are grain-free and machinable, making them appropriate for composite and layup tools, and for mold and foundry patterns. The FR-4500, a workhorse that offers a good surface finish, is appropriate for composite and layup tooling with continuous service temperatures up to 195º F (90° C). It is fully cured, a completely crosslinked system lacking any fugitive components. Because of this there is no outgassing at or below the continuous service temperature. This fine-cell series is recommended for applications that require a smooth surface finish. Similar to the FR-4500, the LAST-A-FOAM® FR-7100 Multi-Use Core Series is also fully cured and ready-to-use. It is good for composite layup tools that process at less than 200º F. For applications requiring higher strength, greater detail, or increased heat and pressure resistance at process temperature, a density of 20 pcf is usually the best choice. Typical uses include drape-forming tools and vacuum-form tools. While our FR-4500 and FR-7100 are designed for moderately elevated-temperature tooling applications, in contrast, our LAST-A-FOAM® FR-4700 High-Temperature Tooling Boards can withstand peak temperatures up to 420° F (215° C) and continuous-use temperatures up to 350° F (177° C). They readily support prepreg composite layup tooling, prototype machining, vacuum forming and pattern making. When choosing the right product for your tooling application, a key consideration is the number of cycles or pulls the tool will last during its lifetime. 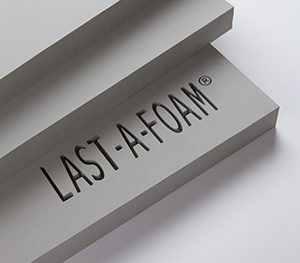 LAST-A-FOAM® FR-3700, a flame-retardant polyurethane foam, is our aerospace-grade foam and the strongest of our tooling foams. The product offers strength and toughness to support more molding and demolding cycles and has a relatively high glass transition temperature (Tg= 270° F, 130° C) when compared to the FR-4500 and FR-7100. The strength also allows for cutting sharp, defined edges and detailed profiles. For tooling processes that fall in-between the thermal properties of the FR-4500 and the FR-4700, the FR-3700 may be a good candidate. All foams have a temperature at which they start to soften, based on the glass transition temperature (Tg). Detailed material qualities, including the glass transition and continuous service temperatures, are listed in our product technical data sheets (TDS). When determining the required physical properties of your tooling foam, one will need to consider any required processing pressures, and how much wear and tear the tool will be subject to during the molding and de-molding process. “How durable does the tool need to be? How many mold and demold cycles does it need to withstand? And, how damaging is your de-mold process, as that will vary by method?” Pagni says. Many aerospace composite parts – especially carbon fiber tooling and structural parts – require autoclave conditions of a certain pressure to remove voids. For example, a pressure of 100 PSI is common for high-end advanced composites. This requires selecting a tooling foam with the density, strength and Tg to withstand a compressive force greater than produced in the autoclave. Customers often ask about the surface smoothness of the tool or product produced from the foam material. In the case of a part that’s being machined to shape after tooling, the surface produced may not matter. But if the foam is being used to produce an actual part that will be used in an assembly, surface profile is more likely to be a consideration. The technical data will provide general guidelines on the relative smoothness for each of these foams. However, the foam density is really the driver. The higher the density, the smaller the cell size and the smoother the surface the foam will produce. A high-density FR-4500 foam, at 50 pcf, will offer the smoothest surface of all four tooling board series. If you’re looking to cure a highly detailed part at 200º F, but would like to get a high number of pulls off the tool e.g. 100 or more, he recommends using the 40-pound FR-3700 (FR-3740) instead of the FR-4540 (FR-4500 at 40 pcf) because the FR-3700 is stronger than the FR-4500 product series resulting in a greater longevity of the finer details The high service temperature of the FR-3700 will also allow better dimensional stability over a number of pulls vs the FR-4530, where the 200° F is slightly above its recommended service temperature. For wet layups or other cures at room temperature, we recommend using the FR-4500 series, basing the density on how durable it needs to be and whether you need a smooth surface. Autoclave cures require matching the material with the process temperatures and pressures. Physical properties such as compressive strength at a high temperature are found in the technical data sheets, and these values should be compared to the required autoclave conditions. Reaction injection molding is a common process that usually yields parts to net shape. Because of this, enhanced surface smoothness is a common consideration that can be addressed through the use of sealers and coatings. You must also consider the pressures involved in the resin transfer process, so you can select the most appropriate density. Depending on your application or process, you may be able to skirt the thermal requirements. Under low atmospheric or mechanical pressures, a tooling material may be held at its heat distortion temperature for approximately three hours. In such a case, we often recommend that a customer test a given product under the required conditions before making a decision. When choosing the right product for your tooling applications, it’s important to understand the products’ properties and how they fit your application. From our customer service experts to downloadable technical data sheets, we’re equipped with the resources and support you need to help you select the most suitable product for your application.